For other uses, see Housekeeping (disambiguation). Housekeeping refers to the management of duties and chores involved in the running of a household, such as cleaning, cooking, home maintenance, shopping, laundry and bill payment. These tasks may be performed by members of the household, or by other persons hired for the purpose. The term is also used to refer to the money allocated for such use. By extension, an office or organization, as well as the maintenance of computer storage systems. A housekeeper is a person employed to manage a household and the domestic staff. According to the Victorian era Mrs Beeton's Book of Household Management, the housekeeper is second in command in the house and "except in large establishments, where there is a house steward, the housekeeper must consider his/herself as the immediate representative of her mistress". Housekeeping includes housecleaning, that is, disposing of rubbish, cleaning dirty surfaces, dusting and vacuuming. It may also involve some outdoor chores, such as removing leaves from rain gutters, washing windows and sweeping doormats. The term housecleaning is often used also figuratively in politics and business, for the removal of unwanted personnel, methods or policies in an effort at reform or improvement. Housecleaning is done to make the home look and smell better and to make it safer and easier to live in. Without housecleaning, lime scale can build up on taps, mold grows in wet areas, smudges appear on glass surfaces, dust forms on surfaces, bacterial action makes the garbage disposal and toilet smell and cobwebs accumulate. Tools used in housecleaning include vacuums, brooms, mops and sponges, together with cleaning products such as detergents, disinfectants and bleach. Disposal of rubbish is an important aspect of house cleaning. Plastic bags are designed and manufactured specifically for the collection of litter. Many are sized to fit common waste baskets and trash cans. Paper bags are made to carry aluminum cans, glass jars and other things, although most people use plastic bins for glass since it could break and tear through the bag. Recycling of some kinds of litter is possible. Over time dust accumulates on household surfaces. As well as making the surfaces dirty, when dust is disturbed it can become suspended in the air, causing sneezing and breathing trouble. It can also transfer from furniture to clothing, making it unclean. Various tools have been invented for dust removal: Feather and lamb's wool dusters, cotton and polyester dust cloths, furniture spray, disposable paper "dust cloths", dust mops for smooth floors and vacuum cleaners. Vacuum cleaners often have a variety of tools to enable them to remove dirt not just from carpets and rugs, but also from hard surfaces and upholstery. Dusting is very important in hospital environments. Examples of dirt or "soil" are detritus and common spills and stains in the home. Equipment used with a cleaner might include a bucket and sponge or a rag. A modern tool is the spray bottle, but the principle is the same. Various household cleaning products have been developed to help remove dust and dirt, for surface maintenance, and for disinfection. Products are available in powder, liquid or spray form. The basic ingredients determine the type of cleaning tasks for which they are suitable. Some are marketed as general-purpose cleaning materials, while others are targeted at specific cleaning tasks such as drain clearing, oven cleaning, lime scale removal and polishing furniture. Household cleaning products provide aesthetic and hygiene benefits, but may cause health risks. The US Department of Health and Human Services offers the public access to the Household Products Database, with consumer information on over 4,000 products based on information provided by the manufacturer through the material safety data sheet. Surfactants lower the surface tension of water, allowing it to flow into smaller tiny cracks and crevices in soils, making removal easier. Alkaline chemicals break down known soils such as grease and mud. Acids break down soils such as lime scale, soap scum, and stains of mustard, coffee, tea, and alcoholic beverages. Some solvent-based products are flammable and some can dissolve paint and varnish. Disinfectants stop smell and stains caused by bacteria. When multiple chemicals are applied to the same surface without full removal of the earlier substance, the chemicals may interact. This interaction may reduce the efficiency of the chemicals applied (such as a change in pH value caused by mixing alkalis and acids) and in some cases may even emit toxic fumes. An example of this is the mixing of ammonia-based cleaners (or acid-based cleaners) and bleach. This causes the production of chloramines that volatilize (become gaseous), causing acute inflammation of the lungs (toxic pneumonitis), long-term respiratory damage, and potential death. Residue from cleaning products and cleaning activity (dusting, vacuuming, sweeping) has been shown to worsen indoor air quality (IAQ) by redistributing particulate matter (dust, dirt, human skin cells, organic matter, animal dander, particles from combustion, fibers from insulation, pollen, and polycyclic aromatic hydrocarbons) to which gaseous or liquid particles can be adsorbed. The concentration of such particulate matter and chemical residual will highest immediately after cleaning, and will decrease over time depending upon levels of contaminants, air exchange rate, and other sources of chemical residual. Of most concern are the family of chemicals called VOCs such as formaldehyde, toluene, and limonene. Volatile organic compounds (VOCs) are released from many household cleaning products such as disinfectants, polishes, floor waxes, air-freshening sprays, all-purpose cleaning sprays, and glass cleaner. These products have been shown to emit irritating vapors. VOCs tend to evaporate and then to be inhaled into the lungs or adsorbed by dust, which can also be inhaled. Aerosolized (spray) cleaning products are important risk factors and may aggravate symptoms of adult asthma, respiratory irritation, childhood asthma, wheeze, bronchitis, and allergy. Other modes of exposure to potentially harmful household cleaning chemicals include absorption through the skin (dermis), accidental ingestion, and accidental splashing into the eyes. Products for the application and safe use of the chemicals are also available, such as nylon scrub sponges and rubber gloves. It is up to consumers to keep themselves safe while using these chemicals. Reading and understanding the labels is important. Chemicals used for cleaning toilets, sinks, and bathtubs can find their way into sewage water and can often not be effectively removed or filtered. There is a growing consumer and governmental interest in natural cleaning products and green cleaning methods. The use of nontoxic household chemicals is growing as consumers become more informed about the health effects of many household chemicals, and municipalities are having to deal with the expensive disposal of household hazardous waste (HHW). 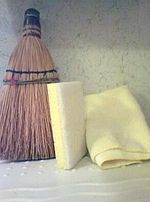 Brooms remove debris from floors and dustpans carry dust and debris swept into them, buckets hold cleaning and rinsing solutions, vacuum cleaners and carpet sweepers remove surface dust and debris, chamois leather and squeegees are used for window-cleaning, and mops are used for washing floors. To ensure safety, protective apparel including rubber gloves, face covers, and protective eyewear are also sometimes used when dealing with chemical cleaning products. A home's yard and exterior are sometimes subject to cleaning. Exterior cleaning also occurs for safety, upkeep and usefulness. It includes removal of paper litter and grass growing in sidewalk cracks. While housekeeping can be seen as an objective activity that can be done by either men or women, some people have argued that housekeeping is a site of historical oppression and gender division between men and women. Housekeeping also has a role in maintaining certain parts of the capitalist economy, including the division of home and work life, as well as industries that sell chemicals and household goods. A survey conducted by the U.S. Bureau of Labor Statistics in 2014 came to the result that approximately 43 percent of men did food preparation or cleanup on any given day, compared with approximately 70 percent of women. In addition, 20 percent of men did housekeeping chores (including cleaning and laundry) on any given day, compared to approximately 50 percent of women. Wikimedia Commons has media related to Housekeeping. Look up housekeeping in Wiktionary, the free dictionary. ^ "housekeeping" Oxford Dictionaries Online. Retrieved 2 June 2013. ^ "housekeeping" The Collins English Dictionary. Retrieved 2 June 2013. ^ "housekeeper" Oxford Dictionaries Online. Retrieved 2 June 2013. ^ Mrs Beeton's Book of Household Management Web version of the book at the University of Adelaide Library. Retrieved 2 June 2013. ^ Dellutri, Laura. 2005. Speed Cleaning 101. Meredith Books, Des Moines, Iowa. ^ Kennedy, Rose. 2006. 10-Minute Housekeeping. Beverly, MA: Fair Winds Press. ^ Executive Housekeeping Today (2004), Volumes 23-25, p. 76. ^ "Household Products Database". U.S. Department of Health and Human Services. Retrieved 3 February 2015. ^ Bredenberg, Jeff et al. 1998. Clean it Fast, Clean it right. Emmaus, PA, USA:Rodale. ISBN 0-87596-509-1. ^ "OSHA requirements for cleaning chemicals. | Occupational Safety and Health Administration". www.osha.gov. Retrieved 2018-12-19. ^ Mainardi, Pat (1970). "The Politics of Housework". Redstockings. Retrieved 3 February 2015. ^ "American Time Use Survey". Bureau of Labor Statistics. June 24, 2015. ^ Lebowitz, Shana (2017-10-11). "The newest decluttering craze is 'Swedish death cleaning,' which hinges on the fact that friends and family won't want your junk when you're dead". Business Insider. Retrieved 2018-08-18. ^ MATTERN, JESSICA (2017-10-10). "Everything You Need to Know About 'Swedish Death Cleaning'". Country Living. Retrieved 2018-08-18. ^ DiGiulio, Sarah (2017-11-02). "What is 'Swedish death cleaning' and should you be doing it? Go ahead. Clean your closet like there's no tomorrow". NBC News. Retrieved 2018-08-18.